Juanita K. Hammons Hall for the Performing Arts, located on the Missouri State campus near the Walnut Street Historic District, is a 2220-seat performing arts center presenting an annual season featuring touring Broadway shows, children's productions, a classical recital series, and a wide variety of individual performances including jazz, dance, classical, and theatrical artists. 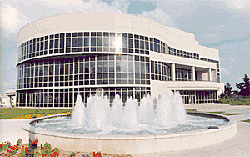 Hammons Hall also hosts the Springfield Symphony, Missouri State music and theatre department performances, and touring pop, rock, and comedy shows. This showcase facility is named in honor of Mrs. Juanita K. Hammons, an enthusiastic supporter of the arts and wife of Springfieldian John Q. Hammons, worldwide developer and philanthropist.